Using a candida test to understand how your symptoms line up with the most common symptoms associated with yeast overgrowth can give you a good idea whether what you are experiencing may be yeast related. While it is not a replacement for medical advice, the candida test is helpful for tracking your symptoms before and during your yeast cleanse. After answering a series of questions you will receive your score and the average score of everyone who has taken the test. You can use this number to track your progress. 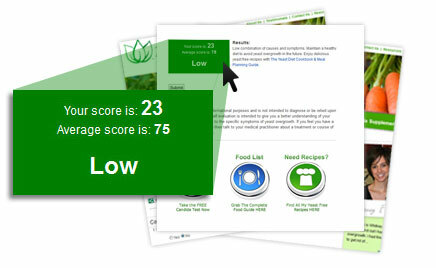 You can retake the test as often as you like to watch your yeast number drop as your symptoms improve. There are many common circumstances that can cause yeast overgrowth or contribute to the overpopulation of yeast in our bodies. This can lead to painful symptoms such as recurring yeast infections, brain fog, gas and bloating, joint pain, unexplained illness, depression and many other side effects that are equally frustrating. This test is designed to cross reference your symptoms with the most common causes of yeast overgrowth in order to provide a score you can use to have a more detailed conversation with your doctor or other medical provider. Many times it is hard to feel like you are making progress and having a benchmark will give you a good way to track your results and stay motivated as you complete your yeast free diet cleanse. Take the test as often as you want but it is recommended that you take it at least once a week during the Candida Diet cleanse.